The Windows Phone 7 version of Big Buck Hunter Pro has a few rough edges, but I still enjoyed it overall. Light gun-style games, i.e. shooting galleries, are just plain fun. And heck, the combination of shooting defenseless animals while an announcer grossly mispronounces everything he says, how can you not love that? Unfortunately, though, the game has just been pulled from the Windows Phone Store. At first glance, one might think Big Buck Hunter Pro had been pulled due to its Coin-Up online mode. Coin-Up is supposed to allow players to create a network account that gets shared between this game and the arcade version, or access their existing arcade account. Sadly, the feature is one-hundred percent broken, as the game can never connect to the online server needed to make it work. However, Coin-Up mode is a relatively minor feature and unlikely to result in excessive customer dissatisfaction. Besides, the problem seems to stem from cut-rate WP7 Xbox Live backend servers. These servers afflict a number of Xbox Windows Phone games from multiple developers, including Carcassonne, Battleship, Gun Bros, Contract Killer, and Crackdown 2: Project Sunburst. Until Microsoft rectifies those server issues, online features just won’t work right in Windows Phone games. Update: I successfully connected to Coin-Up mode after posting this article. It seems that if the 'username' (a 10-digit numerical value) you choose for yourself has already been taken, you'll receive a vague error. Try a different username and see if that works. The real nail in Big Buck Hunter Pro’s coffin stems from its incompatibility with Windows Phone 8. The game plays fine on Windows Phone 7 devices, other than some devices experiencing frame rate issues. Booting it up on a Windows Phone 8 handset and you’d think it worked fine there too, until you tried to actually start a level. At that point, it hangs on a loading screen, never to recover. Considering that Windows Phone 8 has just launched, the last thing Microsoft wants is for players to pick up a game listed in the new releases and find it broken. Thus, it seems they pulled it until the problem can be fixed. 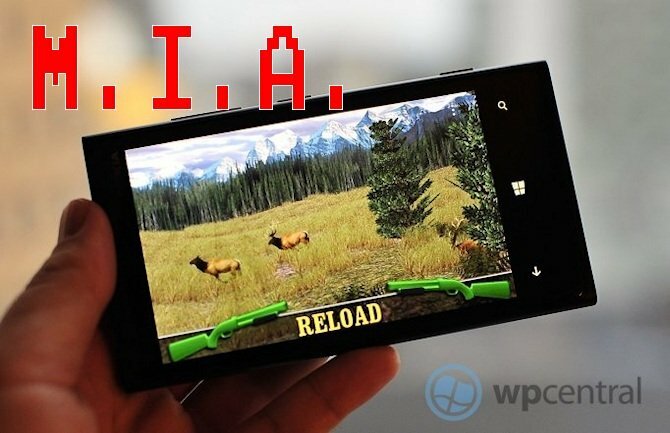 We should note that a handful of other Xbox Windows Phone 7 titles don’t play nicely with WP8 either. Dodonpachi Maximum doesn’t work at all, Shoot 1UP crashes intermittently, and Bullet Asylum runs at twice the intended speed. It will be interesting to see whether these games get pulled as well. Since they’re not as new as Big Buck Hunter Pro, they may just get quietly patched without a fuss. Big Buck Hunter Pro is a faithful port of the popular arcade gun game. Gameplay modes include Single Trek, 3 Trek Adventure, and Bonus Only. Each trek contains five short levels taking place at a real-life American hunting location. The object within a level is to shoot its three male animals while avoiding any females. Bonus Only mode contains six (often humorous) minigames which would normally be found at the end of each trek. For more details, check out our full review. We’ve reached out to Microsoft and developer Merge Interactive for comment on when the game will return to the Windows Phone Store. Don’t worry, virtual hunters; it should be back before you know it. Thanks to Mark Tepper for the tip!